Registration is now open for the 2019 Flying Pig XXII and 2018 Orienteering USA Master's Nationals. Friday will be a single day middle distance National Ranking Event and you register with normal age classes. Sat and Sun will be a two day total time classic event. If you turned 35 or over in 2018, (and meet OUSA eligibility requirements), you can compete for OUSA Championship medals in the Master's Nationals. The EventReg registration system will automatically let you select appropriate age classes based on your 2018 age. If you are younger, there will regular age classes and Flying Pig medals. Thanks Mike. Is course length information available somewhere? Carter Caves was used for the us team trials in 2015. Good area, perhaps ocin's best. Friday's venue, Camp McKee, is new. 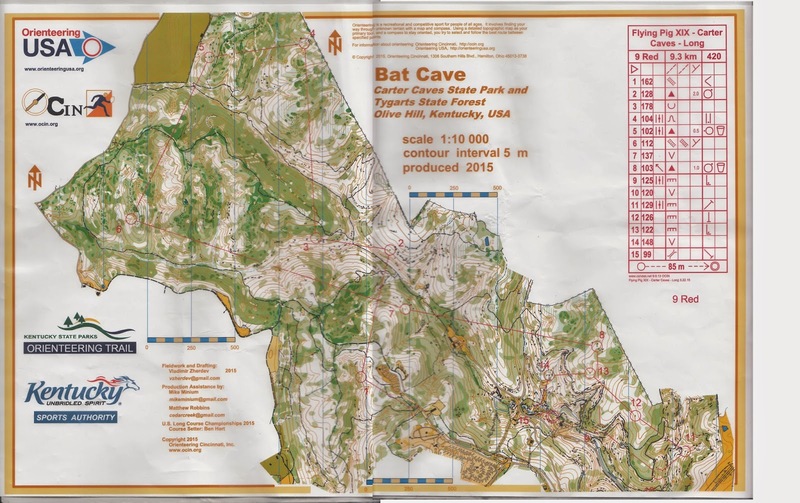 Carter Caves was the site of the Long and Middle races for the 2015 US Individual (SML) Champs (nka "Nationals"), as well as team trials for both WOC and JWOC. Morehead College was the Sprint venue. I'm not sure how far along the courses are, but changing courses/classes is pretty routine for me. Preliminary event information is here. Carter Caves was used for the Middle and Long Championships in 2015 and many photos are here. Courses are being planned as "classic" winning time, but length and climb info is not anywhere near final yet, pending some site visits, map updating, and test running. Route Gadget has the maps and courses used in 2015. Paper prints of the old maps may also be ordered with registration. There has been a little map updating and some additional terrain mapped. As GuyO mentioned, the map to be used on Friday is brand new. Make lodging reservations early; the park has a limited number of lodge rooms and cabins, all blocked for those who mention "Flying Pigs 2019". Any lodging outside the park is at least 15 minutes drive away. One needs to be extra careful with accommodation in mid_Kentucky, some places there are really scary. Watch the original Evil Dead to get an idea. We booked a lodge room last week and cabins were already full then. Yes, I think the cabins are already gone. I believe there is also some sort of primitive group cabin in the campground - if anyone has a school team or youth group, you might inquire about that. An area overview map has been added to the website. Here, you can see who's registered. The Flying Pig is fast approaching, and deadlines are sneaking up! We have extended the deadline to register without late fee through Tuesday, March 5. Last chance to register without late fee! We've extended a couple more days until the registrar gets too overloaded. Poison ivy should not be in leaf. If you are very sensitive, you may still be able to get it if you grab the fuzzy dead-looking vines. There's not much - perhaps someone else who orienteers in winter in the Midwest and is highly sensitive can contribute if they ever actually get it this time of year? I do not know if campground showers will be open. I'll ask. Thank you for the poison ivy info, Mike! If the campground showers aren't accessible to non-campers, I found this place near the CVG airport as a backup: Silverlake / The Family Place, 301 Kenton Lands Rd, Erlanger KY, 859-426-7777, $10 non-member day use fee, open 9am to 6pm on Sundays. The area I recall is exceptionally muddy, which will be aggravated by spring time snowmelt. Before going to airport for TSA groping, it is a good idea to take a shower. I normally just have a couple of 2 litre plastic bottles with warm water (filled in the morning -- not frozen overnight in the trunk), and take a shower by pouring the water on myself after the run. You can also carry a washcloth and small towel to supplement the water bottle and give yourself a "sponge bath" rather than a dousing if (like me) you don't like shivering. Just south of CVG on I-75 is TA truck stop. Daedalus took a shower there after a meet at E-Idlewild and before getting on an international flight. I hope his flight was uneventful? Not too close to the sun? Registration closes at midnight tonight! Daedalus is known for uneventful flights that aren't too close to the sun. Are climb totals for the courses available anywhere? Updated race information including updated lengths and climb info, has been posted. Yes, the area is rugged and hilly, you will get plenty of climb. 600 meters climb on 7.8 km. Wow , this definitely will be "fun-aplenty" as my Georgia friends would say. There was just a cancellation for a 2-bedroom cottage w/fireplace at Carter Caves. There was no waiting list. Call now. The phone number for the cottage reservations at Carter Caves is: 606-286-4411. I just reserved this but there may be a room available in the cabin if someone wants to share. Just email me. How much do these events typically cost I am just getting back into this ? See the event information page. It depends on your age and OUSA membership status, and whether you run age group courses or non-competitive recreational offerings. Actually, since the event starts tomorrow, show up and run recreational courses. Probably much too late register for competitive courses (which generally have deadlines in the 1-2 week range before atart of competition). Stefan - are you sorted - if not, what time do you arrive tomorrow? I land at 11. I can take you. Picking up car at Enterprise. Let me know if you want me to meet you there. Day 1 Livelox Blue, Red, Green only! Day 2 Livelox, Blue, Red, Orange only! Found in parking lot Sunday - Subaru key with a "Tile" on it. If yours please call event director or registrar ASAP. When we leave the park, it will be left at the Lodge desk. Day 3 Livelox, Blue, Red, Orange only! If you have a different course that I didn't have a map for, you can still upload to the closest course. Mlclimber, I would be happy to add GreenA map and courses to Livelox for Sat and Sun if you give me access.